Drinking enough water is very important to your overall holistic health. This can be fun and easy to do, read on for tips, great flavored water recipes and information. Why is Drinking Enough Water Important? The truth is that water is essential for all life on our planet. Our bodies are made up of mostly water, as is our planet. Everything contains water and everything needs water. If we are not drinking enough water or don't have enough water in our bodies, we cannot be our most healthy selves. Now, more than ever, it is important to be drinking enough water. I say this because there is more pollution and toxins of all kinds around us now than there ever has been in history. Nature's solution to pollution is dilution. Work with this principle by making sure you are drinking enough water to deal with the daily onslaught of chemical and electrical pollution. What Kind of Water is Best? The question isn't, 'are you drinking enough water? ', the question is, 'are you drinking enough good quality water?'. There is an ongoing debate over which water is best. Is it spring water? Is it distilled water? Is it RO (reverse osmosis) filtered water? Well, I think about water the same way I think about food. That is, try to obtain your water from as close as possible to its natural state. Ideally this would be water coming straight from Nature. There is a great online database that can help you to locate natural springs in your area. If you are lucky enough to have access to water straight from Nature, take advantage of that. And, as always, do your best. If you can't get water straight from Nature, get the best water you can. Avoid water in plastic bottles. Plastic bottles, especially thin flexible plastic bottles, contain toxic material that easily leaches into the water held inside. There are chemicals in these plastics that mimic the estrogen in our bodies causing and contributing to a whole host of health issues. For all of the wine drinkers out there; ask yourselves if you would ever consider buying wine in a plastic bottle? The answer is a resounding 'NO' because wine drinkers and wine makers know that putting wine in a plastic bottle would highly degrade the quality of the wine. The same goes for water.... And water is a much more valuable substance to our health than wine is. It really should be given more consideration in how it is obtained and stored. If you do choose to get your water in plastic bottles, find the hardest thickest plastic possible and always keep these plastic bottles out of direct sunlight and away from high heat (i.e. leaving a plastic bottle of water inside the car on a hot day is not a good idea). Municipal tap water contains many substances that are damaging to our health. Some places have even added fluoride to the municipal water system and have tried, for years, to convince the public that this is in the best interest of your health. This is just not the case. Recently, there have been communities that have protested this and have finally gotten the fluoride levels reduced in their water system but there is still a long way to go. Do your part in your own community to find out if fluoride is being added to your city's water and what can be done to have that stopped. I don't recommend drinking or showering with any tap water without using a filter. I mention showering because our skin is our body's biggest organ and you will 'ingest' water through your skin while showering. Drinking enough water is about the food you eat too. Eating a diet high in fresh, whole, raw, organic fruits and vegetables will help to keep your body hydrated. This is the essence of getting water straight from the source. A high water content fruit or vegetable will provide your system with water in a very pure and very easily ingestible form. The more processed or cooked a food is the less water it will contain. A person eating a diet high in processed/cooked foods, like the SAD or standard american diet, will be far more dehydrated (i.e. prone to unhealth) than a person eating a diet high in raw whole natural foods. Eating an abundance of processed/cooked foods will make you thirsty because your body is screaming for water to balance the dehydration and to dilute the toxic effect of processed foods. There is a vicious cycle here when a person eats a processed/cooked meal and then quenches their inevitable thirst with a sugary soft drink which just adds to their dehydration. In this case the person is never drinking enough water. If you eat a diet high in raw whole organic fruits and vegetables you will find that you are not as thirsty because your body is being provided with great quality water from your food. Like everything, water contains energy. Water is a very unique substance in that it can take on the properties of things around it. On the physical plane we see this as water is a solvent for many things. On the energetic plane this is harder to see but no less real. The work of Dr. Masaru Emoto has shown how water can take on the vibrations or energy of the environment it is in. He has shown how water from a very polluted area will have a very different structure or energy signature than water from a pristine environment. He has also shown how the same water can be altered by intentions consciously given towards that water. Beyond scientific proof, many know this to be true from experiences with holy water from sacred places. Water does carry messages or information with it. With this in mind doesn't it make sense, while drinking enough water, to drink only water containing positive or health benefiting information? 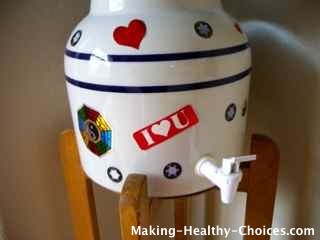 Do this by getting your water from a good source and/or putting your own positive intentions into your water. intend a very specific message into your water by holding the water close to your body and infusing the water with a specific thought, information or request. 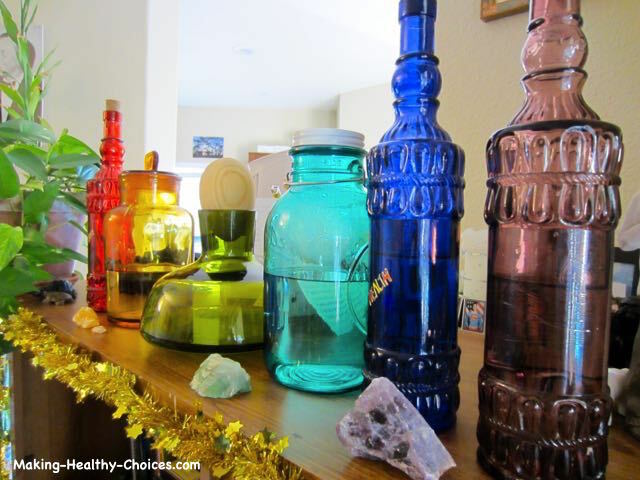 We collect colored glass bottles and store our drinking water in them. Like everything on this site, take away with you the information that you need now. If something here doesn't resonate with you well right now, leave it behind and pay attention to the information that makes sense to you now. The answer will vary for each person depending on many factors. What type of diet do you have, are you eating mostly cooked/processed foods? The more cooked foods, processed foods, junk foods, additives, preservatives, packaged foods, etc. you consume the more water you will need to drink. How much are you exercising? If you are sweating a great deal you will need to be drinking enough water to replace that water in your system. How hot/dry is the climate where you live? The hotter/drier the air is the more water you will need. How toxic are you? If you have a very toxic lifestyle (high stress, drug/alcohol use, city living, negative attitude, negative relationships, etc. ), you will need more water. Are you sick? If you are congested and your body is trying hard to move something out of your system, drinking enough water will assist with this. Are you doing a cleansing fast or a detox cleanse? While doing this it is very important to make sure you are drinking enough water. 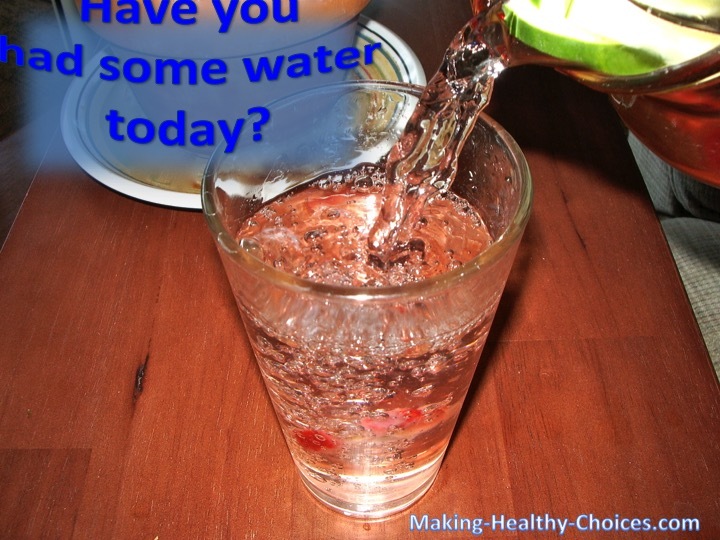 Drink good quality, room temperature water first thing in the morning on an empty stomach. Throughout the day, when drinking enough water for you, always ensure you drink it on an empty stomach. This will help you to get all the benefits of the water without hampering digestion. When drinking water, ensure to structure it somehow. I think of this as creating my own designer water and I do this in different ways all day long. Use the tips mentioned above and the recipes below to come up with all sorts of different ways to give structure to your water. Your cells will love it! In terms of drinking enough water, a basic guideline is to drink half your weight in ounces per day. For example, if you weigh 110 pounds you would drink 55oz of water per day. This is simply a guideline which gives you a general idea of how much to drink, NOT a rigid rule. Vary your intake depending on your situation and the circumstances as described above. Bottled water is a HUGE industry including flavored bottled waters and 'electrolyte' or sports drinks. Unfortunately these flavored waters from big companies contain ingredients such as high fructose corn syrup, other unhealthy sweeteners and color dyes. All of these things take away from the hydrating effect of the water and have a toxic effect in your body. 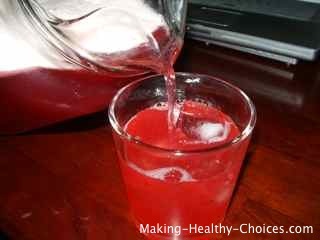 The great news is that it is very easy to make your own flavored water, electrolyte water or sports drink. Here are some easy recipes to make the most refreshing water that is full of electrolytes, nutrients and amazing taste! For best results always use fresh organic ingredients and start all your recipes with LOVE - it is the secret ingredient that will make all your recipes shine! I am continually adding recipes to this site (food recipes as well as homemade skin care products and homemade cleaning products). Check back often or subscribe to this site to know when anything new is added. The recipes below are an easy and enjoyable way to assist you in drinking enough water. Simply adding a slice of lemon to your water will enhance the taste and help the water to become more hydratable for your body. 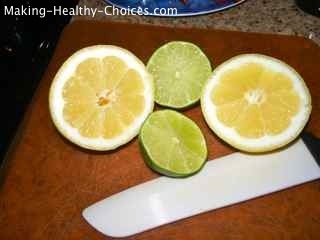 Squeeze fresh lemon and lime into your water for an even more refreshing variation. For convenience, I will juice several lemons and/or limes ahead of time and freeze them in ice cube trays. Keep these in your freezer and simply add a lemon ice cube to a glass of water any time for a quick and easy lemon flavored water drink. For more great ways to use lemons, click here. Adding just a bit of raw organic apple cider vinegar to a glass of water is a great way to give the water some structure with a very unique taste. And you will also benefit from the cleansing and probiotic properties of the apple cider vinegar. Hydrosols are the steam distilled water soluble essences of the plant. And these can be a great addition to your drinking water. Just add about 1/2 oz of hydrosol to a 8oz glass of water for a very beautiful and subtle flavour. Play with the amounts and combinations to come up with a water you love! My favourite so far is adding mint hydrosol to my water - it adds the most refreshing subtle hint of cooling mint to a glass of water. Learn more about hydrosols and how to make your own here (video and article). 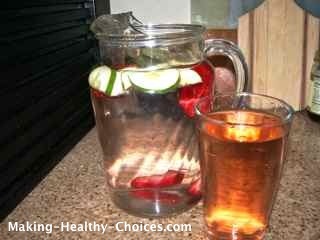 In a large glass pitcher (I use a 60oz glass pitcher), add 4 sliced strawberries and 8 cucumber slices. Fill with good quality room temperature water. You can drink immediately or for more flavor let this sit for a while. The water will turn a beautiful pink color and will taste and feel very refreshing. 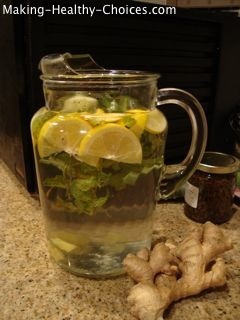 In a large (60oz) glass pitcher, add 1 tsp freshly grated ginger, 6 freshly cut ginger slices, 4 meyer lemon slices and a few sprigs of fresh mint leaves. Fill with good quality room temperature water and let sit for at least 20 minutes. Enjoy! In a large (60oz) pitcher, add 8 freshly cut cucumber and 4 lemon slices. Fill with good quality room temperature water. Enjoy immediately or let sit for more flavour. In a blender, blend all ingredients. I typically use about 20 oz water, 1.5 lemons juiced, 1 tbsp of honey and 1/2 tsp of sea salt. I encourage you to use your tastebuds as your guide and to adjust these ingredients to what feels right for you. There may be days when your body will want more salt and other days when your body will be asking for more honey or lemon juice. Depending on your current electrolyte balance and needs you will want to make a drink that is tailored for you and your tastebuds will help you to do that. **Date syrup is easy to make. Pit and soak dates in water for at least an hour. Can use the soak water alone for a light syrup or blend soaked dates together with soak water in blender for heavier syrup. Adjust water to adjust heaviness of syrup. This can be made ahead of time and stored in the fridge. This is a refreshing and delicious twist on the electrolyte drink above. 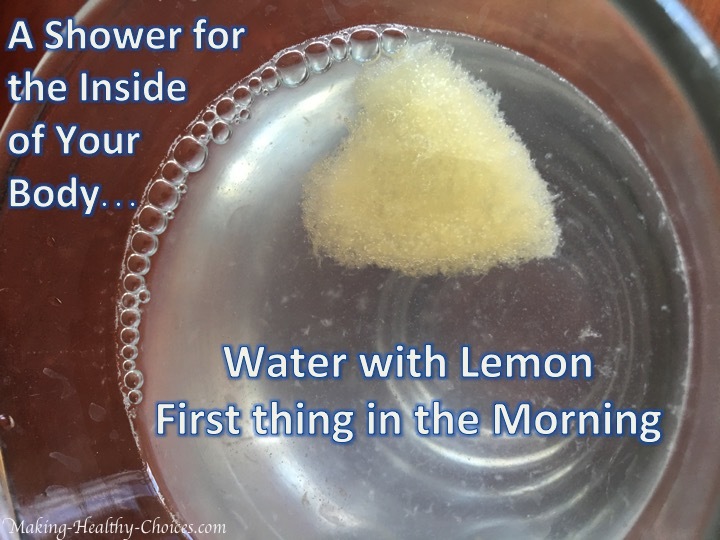 A perfect lemonade full of nutrients and electrolytes to keep you hydrated. Blend all ingredients in a blender and pour into a glass pitcher for serving. Drink as is or serve over ice. This is the best lemonade I have ever tasted! I think you get the idea. There are many other things you can add to your glass pitcher of water. Use your creativity to come up with different combinations of the above or different ingredients to make your own flavored waters. Share your favorite flavored water combinations in the comments section below. Don't want to make a whole pitcher? Lessen the amounts and make just one glass. Having a party, summer barbecue, pool party or picnic? Make several pitchers each with a different flavour of water. Or have all ingredients laid out and each person can create their own flavored water in their individual glass. Drinking enough water is one of easiest ways you can improve your health. Make sure you are getting enough water into your body by improving your diet and drinking enough water for you based on your current situation. Enjoy your water... enjoy your life... You are worth it!! !